WILLIAMSBURG, Brooklyn (WPIX) — Neighborhood favorite Vinnie’s Pizzeria is serving up square cheese slices with blue and orange swirl on top that look like Tide laundry detergent pods. The idea behind the menu item is to poke fun at the latest absurd trend sweeping the nation, the so-called “Tide Pod Challenge.” Young people eat the pods on camera and then upload the video to social media platforms. The American Association of Poison Control Centers says it has seen a sharp increase in calls for intentional exposure to laundry packets. PIX11 caught up with the co-owner of Vinnie’s on a busy Friday night. The little pizzas look more like mini calzones. 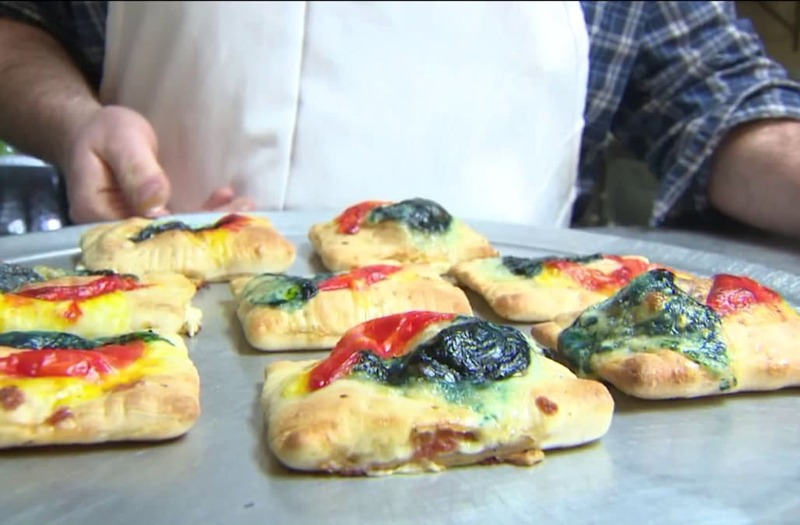 “It’s pepperoni, it’s mozzarella it’s ricotta, it’s some Italian spices and it’s wrapped in pizza dough and it’s covered with food coloring and dyed cheese on top,” said Sean Berthiaume. “They’re just kind of supposed to resemble the pods themselves and how they’re supposed to have the blue and orange hypnotizing swirl on top. The whole eating laundry detergent pods is a ridiculous things so people get that we’re trying to make fun of the situation and how ludicrous it is,” said Berthiaume. Berthiaume named them “pied pods.” The Williamsburg neighborhood favorite is known for their unique pies - the cheeseburger pizza, the Santa Clause pizza and of course their pizza box pizza. Tonight we found customers coming in just for the pied pods. “I would admit that I would like to try a tide pod,” laughed Emily Heer. Instead, Heer tried the pizza version and gave two thumbs up. “Really good, really really good,” she said as she bit into a pied pod. “I’m not trying to make people eat soap, I’m trying to make people not eat soap. I think it’s a stupid thing and also there are tons of news reports, everyone is talking about it so it’s not like us keeping this going, it’s all over the place. We’re just saying look how ridiculous this is,” said Berthiaume. Social media sites have removed video of people biting into the actual laundry pods. But much to Berthiaume’s dismay, Instagram twice removed pictures of the *edible* pied pods on Vinnie's Pizzeria’s page. “We have a big online following so I mainly made it for them to poke fun at the situation and how ridiculous it was but then people started ordering the pizzas and wanted to eat them so now you have to make them taste good and make sure they’re actually delicious,” said Berthiaume. The pied pods are two for $5. Berthiaume says they’re not a permanent item on the menu, but he’ll keep making them as long as customers want him to. “If you happen to look at this laundry detergent pod and for some reason find it appetizing, then you should come down here and eat actual food,” Berthiaume said with a laugh.